Established in Southern California in 2006, Riot Games is a US-based publisher best known for its multiplayer online battle arena title, League of Legends. As a testament to the level of engagement Riot Games has achieved with its player base, today the average percentage of new players that come through word of mouth is between 85 and 90%. A significant contributor to this engagement is structural: Riot created a game that's simply more fun to play with friends. Players recruit their friends to play with them because they enjoy a better gaming experience. One of Riot's most outstanding examples of player engagement can be found within the process by which it enables its player community to recognize and manage negative in-game behavior, called the Tribunal. The game is played in sessions that last anywhere from 20 to 50 minutes at a time. At the end of each session, if a player behaved exhibited any unsportsmanlike behavior such as berating teammates or name calling, the other players can report him. When enough reports are filed against an individual - a number based upon the ratio of reports filed to total games played - a case file comprised of chat logs (in game instant-messaging), statistics, game data, activity, etc. is generated. This case is displayed at random to members of the tribunal; other players in the community who have voluntarily chosen to participate in regulating and weighing in on community behavior. Through the constructive feedback of peers, Riot attempts to optimize teamwork, cooperation and positive player experiences. The best outcome is for a player to never show up at the tribunal again. Therefore, all systems are designed to adjust, not punish, behavior by allowing players equal ability to reward their peers for positive behavior by 'honoring' them after a game. When players do actually get punished, they are sent all the details in their case files: what they did, how others felt about it, why it had a negative impact on player experience, and why it was bad. In Riot's example, it is peers - fellow players - who are applying and enforcing standards of appropriate gaming behavior; they are devoting their discretionary time to preserve the quality of experience for everyone. This strengthens the community, gives it greater credibility and authority, and at the same time frees company resources to be spent on more valuable opportunities. It also fosters greater engagement by players and a stronger commitment to the game's ecosystem. 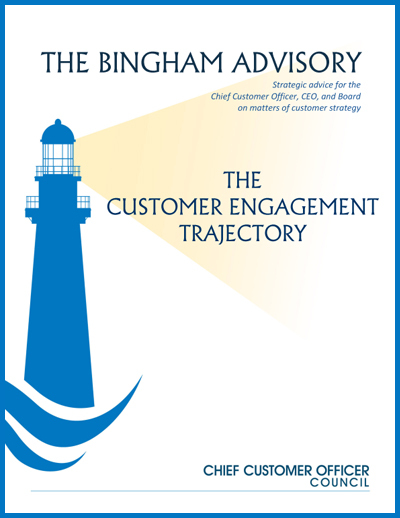 I'm beginning 2014 with the exciting announcement of a new Bingham Advisory: The Customer Engagement Trajectory. Based on my work and discussions with Council members and senior customer executives, this latest edition reveals how customer engagement is defined, how it can be measured, and where it emerges in the business-customer relationship to provides its greatest value. In addition, I share interesting details about how real world companies such as MetLife, Oracle, and Riot Games are engaging their customers and enjoying bottom line improvements to revenue and shareholder value as a result. Download your free copy here and follow my blog where I'll be posting excerpts over the next few weeks. Over the past number of years I’ve taken my wife and three teenage children on extended backpacking trips. Well aware of the risk of injury in the wilderness, I attended a wilderness first aid course. One key principle was drilled into me over and over again: Assess the scene. Often, those first on the scene of an accident rush in to help, jeopardizing their own safety or worse, causing greater harm to any victims. Similarly, customer executives and especially chief customer officers need to “assess the scene” before pushing their agenda to create a customer-centric culture. Although we as customer executives might be tempted to argue that creating a customer-centric culture should come first and foremost, in situations of high stress, it is inevitably shoved to the back burner. A physician can’t help you with your diet when you are in a diabetic coma any more than the fire department can teach safe driving habits while they are extricating you from a wrecked car. Just as the time for preventive measures is long before the accident, attention to culture must take place before the crisis. Identify the most dissatisfied customers at risk of churn through whatever means possible (engagement measures, account team reports, escalations, surveys, social media, etc.). Prioritize and connect with the highest priority customers to discover issues and needs, be they urgent or latent. Gather a cross-functional team to understand, assess, prioritize, and resolve issues. Most importantly, the team must close the loop with customers, either indicating that the issues will not be addressed or providing a time frame for their resolution and ultimately delivering on that promise. As is said in political arenas, “Never waste a good crisis.” A crisis is hardly the time to focus on creating a customer-centric culture. However, by understanding and leveraging customers to weather a crisis, customer executives foster goodwill and lay the groundwork for an increased focus on customers after the crisis has passed. Once in the clear, CCOs are in a much stronger position to enlist the larger organization in preventing future crises.